Easy Blackened Shrimp Tacos are a healthy, gluten-free, and quick taco recipe to whip up on a busy weeknight! 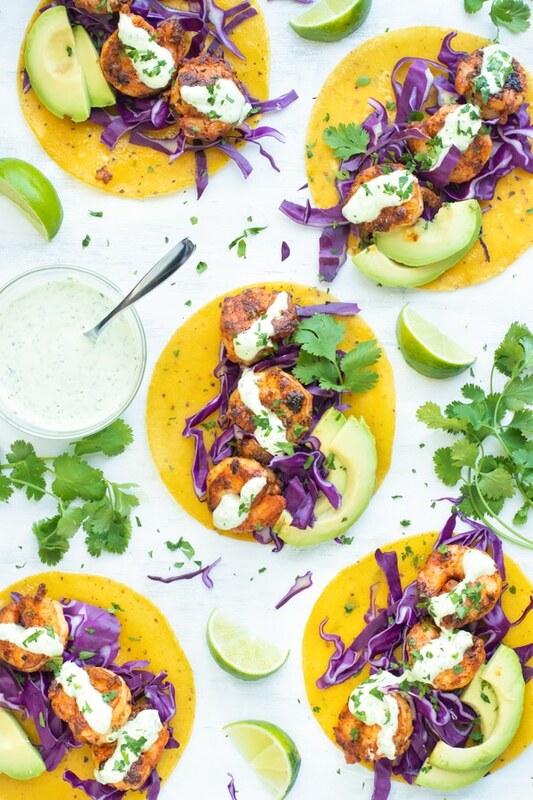 Toss together your blackened shrimp seasoning, whip up the cilantro lime shrimp taco sauce, and you’ll have this easy taco recipe on the table in under 30 minutes! A wave of busyness begins to set in the first week of August here in Austin. Back-to-school commercials come on between your favorite TV shows, the highways get insanely busy, and we avoid the San Marcos outlets like the plague! It is in times like these that having a good, go-to, 30-minute blackened shrimp tacos recipe comes in handy. There is no need to prep ahead, remembering to thaw out chicken, or throw your ingredients into a Crock-Pot 6 hours in advance. 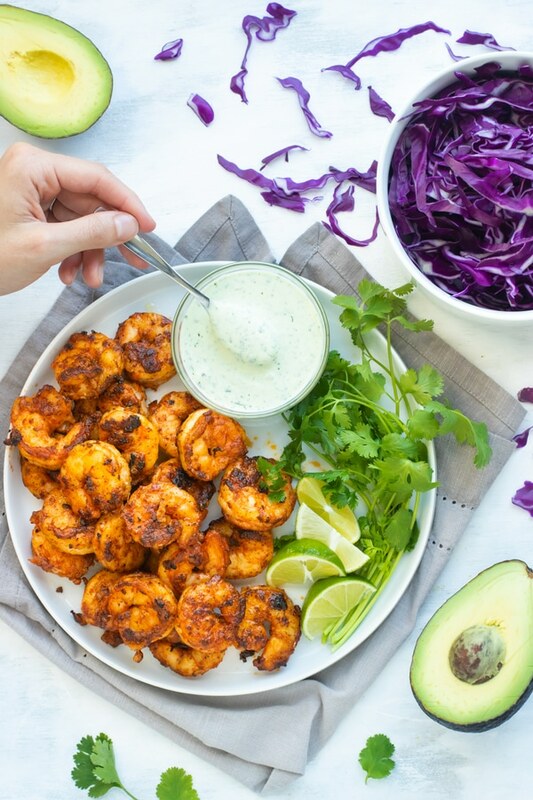 All you need to do is whisk together your blackened shrimp seasoning, saute your shrimp in a cast iron skillet, and make the most delicious cilantro lime shrimp taco sauce… all in under 30 minutes! Making blackened shrimp may seem complex, but really it only takes a few simple ingredients (that I bet you already have in your pantry), a little butter or oil, and your trusty cast iron skillet. To be honest, I should have Cohl come on here and talk about the best way to take care of a cast iron skillet since he does such an incredible job with ours. But one key takeaway: never, ever, ever, wash it with soap and water!! AND takeaway #2: be sure to season your cast iron skillet BEFORE you start cooking up these blackened shrimp tacos. <–Definitely made this rookie mistake before! Now that you have your cast iron skillet out, let’s whip up the blackened shrimp seasoning for these spicy shrimp tacos. I would almost bet that you already have all of the spices you will need to make this blackened shrimp seasoning. Want to know what they are? Was I right? Did you have all of the blackened shrimp seasoning ingredients on hand? Good! Then it’s time to move on to what size shrimp you need! As you will see in the recipe below, jumbo shrimp are used. Also notice that the shrimp have already been peeled, deveined, and tails removed. Feel free to buy shrimp that have not been peeled, deveined, or had the tails removed but know that it will take another 20-30 minutes for this process. If you can save $5/pound it might be worth it, but normally it will probably only save you a couple of bucks! Your blackened shrimp are cooking away in the cast iron skillet, so now it is time to whip up that refreshing cilantro lime shrimp taco sauce! Food Processor – I prefer to use the smaller 4-cup food processor when making taco sauce, salad dressings, or anything that only requires a few ingredients. Vitamix – This might be a bit overkill, but will work if it is the only blender you have on hand. Nutribullet – Another great option, but you might want to chop up the cilantro a bit before you add all of your ingredients into it! 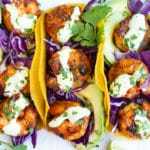 How Can You Evolve this Blackened Shrimp Tacos recipe? Instead of cooking the blackened shrimp in butter, feel free to use olive oil instead. 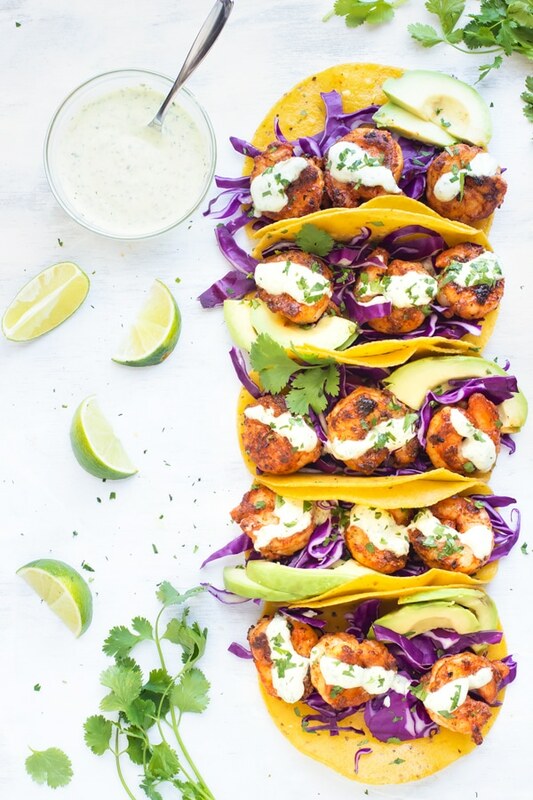 To make these easy shrimp tacos completely dairy-free, also use dairy-free plain yogurt instead of the Greek yogurt used in the shrimp taco sauce. On a keto or low-carb diet? Serve up the blackened shrimp with the cilantro lime taco sauce over cauliflower rice instead of in corn tortillas! Ok, do you feel ready to tackle the school year with this easy shrimp tacos recipe? Awesome! Let’s go! Easy Blackened Shrimp Tacos are a healthy, gluten-free, and quick taco recipe to whip up on a busy weeknight! Toss together your blackened shrimp seasoning, whip up the cilantro lime shrimp taco sauce, and you'll have this easy taco recipe on the table in under 30 minutes! Place deveined shrimp in a large bowl. In a medium-sized bowl whisk together paprika, garlic powder, cayenne pepper, oregano, salt, and pepper. Sprinkle seasonings over shrimp and toss to combine. Place butter or oil in a cast iron skillet over medium heat. Add half of the shrimp to the skillet. Cook shrimp for 3-4 minutes per side. Repeat with remaining shrimp. While shrimp are cooking add yogurt, cilantro, lime juice, olive oil, and salt to the bowl of a food processor. Process until smooth. 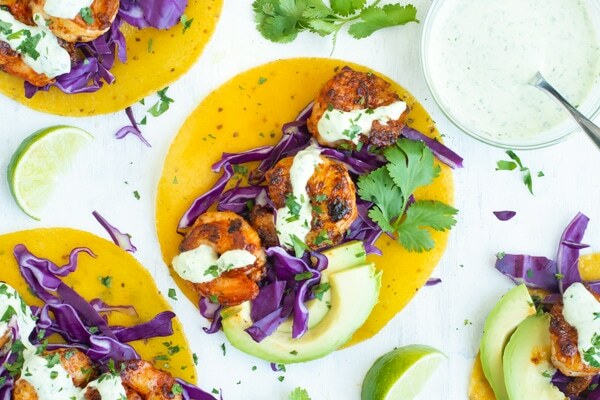 Serve shrimp in a toasted corn tortilla with cilantro-lime yogurt sauce, red cabbage, avocado, and additional cilantro. See this recipe in Healthy Meal Plan #3. *Instead of tacos, you can serve blackened shrimp over cauliflower rice for a low-carb alternative. **Nutritional information is calculated for 2 tacos. 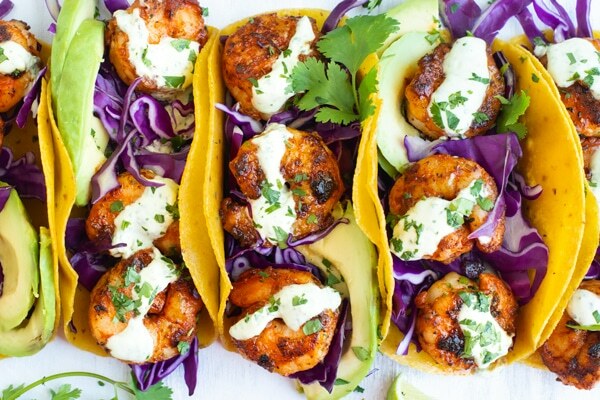 Want more recipes like these Easy Blackened Shrimp Tacos? I need to make these again. So good! I love all of the seasoning blend. Basically — Perfect! Thank you so much, Mike!! The seasoning blend definitely gives these tacos a bit of flavor. Thanks for your comment and rating! !